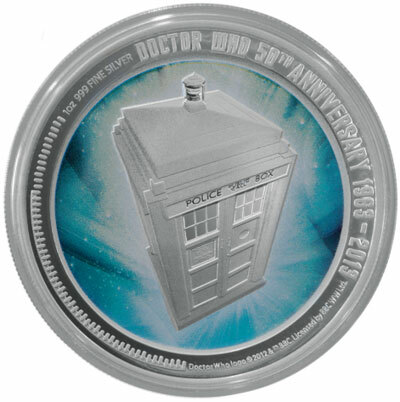 Limited mintage coins have been produced to celebrate the 50th anniversary of Doctor Who, a British science fiction television show about the adventures of a time traveling humanoid alien who explores the universe in a TARDIS (Time and Relative Dimension in Space). Produced by the BBC, Doctor Who is the longest running science fiction television series in history. The 1 oz 99.9% pure silver proof coins are struck by the Perth Mint of Australia on behalf of the New Zealand Mint. The reverse design of the coin depicts the TARDIS, used by the Doctor to travel through space and time. The colored background represents multi-dimensional time travel. The inscriptions around the outer circumference include “1 oz 999 Fine Silver” and “Doctor Who 50th Anniversary 1963-2013”. The obverse of the coin features the Ian Rank-Broadley effigy of Queen Elizabeth II, along with the “2013” date and monetary denomination of “Two Dollars”. The coins are issued by the New Zealand Mint as legal tender of the South Pacific island nation of Niue. 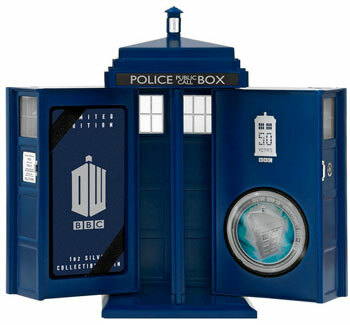 Each coin comes packaged in a special presentation case in the shape of the TARDIS with a BBC branded shipper. As the doors of the TARDIS are opened the familiar ‘vworp vworp’ sound is heard as the coin is displayed. A numbered certificate of authenticity is also included. No more than 10,000 of the Doctor Who 50th Anniversary 1 oz. Silver Proof Coins will be issued in the special TARDIS packaging. Later this year, an eleven-coin collection will be issued, with each 1/2 oz silver coin celebrating the Doctor in his various regenerations. For additional information or to place an order, please visit the Perth Mint website. I think I’d buy it just for the box!